On the 27th of July this year, which was observed as Guru Purnima day – a day where we remember our gurus/teachers in life, a meme which was going viral on WhatsApp showed a student prostrating before “Google” and paying his respects on Guru Purnima day to the search engine! As much as it’s a joke to laugh about, one cannot miss the irony looking at the reality of the search engine’s clutch on our lives today! Google today, is a gargantuan Eco system. But here, we are referring to its earliest avatar –the search engine. For this generation, their first and probably only chosen resort for discovering answers to any question is “Google”! School is just for parents’ reassurance! Our generation which studied and survived without Google in those days seem so dated now! In conversations among our peers, this dialogue is often said and heard – “In our times there was no Google. We all worked so hard. And look at kids these days! They just Google and get all information what they want without moving their a**s!” That the lines are often pregnant with envy which is never missed by the kids is another matter! Well, forget this generation. What will happen to “us”, the “Doordarshan” generation of the 70’s and 80’s if the search engine stops working one fine morning??? Where will we get those “thought for the day” messages for circulating every morning in the WhatsApp groups?? How do we take important decisions like whether to dry clothes inside or outside? Go back to the old fashioned way of searching the Newspaper for weather forecast! And use the thumb rule of drying clothes outside if IMD says heavy rain is in store for the day! Did you just get used to the Uber or Ola App after repeated pestering by your kids? Then time to get back to the old ways of hailing the cab on the road and haggling about the faulty meter or the amount “above” the meter! One may have to think many times before taking up the challenge of trying out some new exotic recipes at home! And have to go back to the time-tested way of calling the mother for any recipe! And have to start maintaining that cooking book! And as parents, forget about becoming heroes in the eyes of children by answering some weird, tough questions on general knowledge or some such thing by surreptitiously checking on Google! Tieing that saree the very traditional way for the puja is going to be nerve-wracking! Where will you get the jokes for the all-important seminar the next day? And where will one find answers to all those silly and not so silly “How to…” questions? I am just listing the obvious. It’s clear that not this just generation or the Gen Next, even the older ones today, cannot pass a single day without Google. Google spent or is still spending tonnes of dollars on traditional media like TV for popularising the idea of “googling” with older generation as their main target audience! When you have the most popular online platform trying to spread awareness about itself through TV commercials, Billboards, Newspaper ads, irony just “googled” for the best way to commit suicide!!! Look at these TVCs here! These are certainly endearing but I wonder if today is there a real need for anyone to advertise virtues of “Google”??? 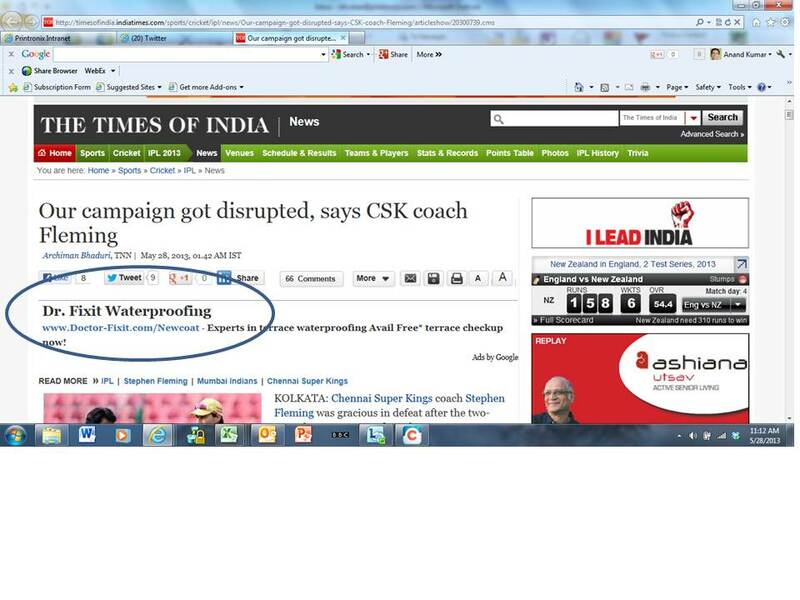 Well, probably this will fall under CSR for Google for helping the economy of the country with its huge ad spend! Jokes apart, Google is participating in real CSR for example with projects like providing Free Wi-Fi at Railway stations. 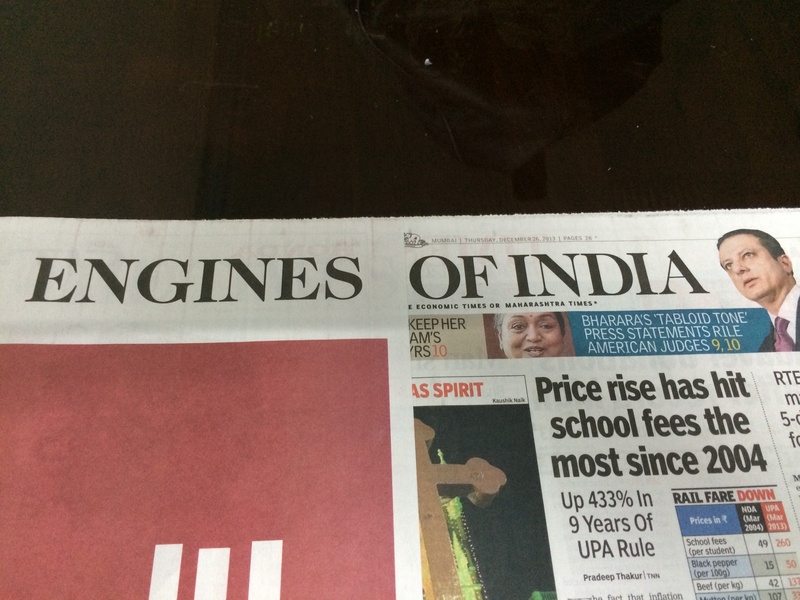 But the larger game plan must be to make people get used to the Google Ecosystem which is today omnipresent! From Search to Mails to Video sharing to Smart phone OS to Cloud sharing to Photo sharing to so many things! While there are options and semblance of competition in others, for internet search, competition is non-existent or is far off. Any product with no competition is worrisome. We can see today how SEO techniques are being used by most to influence search results and increasingly are either not reliable or dis-honest! Time to have a challenger to Google! Ad today, Sad Tomorrow – A Brand Ambassador’s soon to be story!!! Since the time, Sindhu won a Silver and Sakshi a Bronze for India at the Rio Olympics, their phones (probably endorsed by a Kareena or an Alia) I guess haven’t stopped ringing. Or perhaps their managers’. For, many brands are on their way to signing them as brand ambassadors. For now it’s O.K., for Sindhu or Sakshi to sign on the dotted line in these endorsement contracts and make hay while the medal shines. However not if the Government pushes forth the changes in the Consumer Protection bill which proposes jail term and fine for celebrities in case of misleading advertisements for products they endorse. The intention being to make celebrities also responsible for products they endorse apart from the manufacturers. “Consumers tend to get influenced by the promise made by the celebrities in ads” is the argument behind the proposed move. As a marketing professional I have never been very excited about using celebrities in ads to push a product. In B-schools every year, one popular project students carry out with the blessings of their professors is to find out the effectiveness of celebrities in an ad campaign. That the study is done regularly conveys that the jury is still out on that. At a superficial level though, it is commonly accepted that use of a celebrity helps break the clutter and differentiate the ad. Though as per me, this is “laid back, lazy creativity” as there are indeed many other ways to break the clutter. Using celebrities is of course a low hanging fruit for those with big budgets and is often deployed as a creative strategy when one can afford. I just realized that this piece is not on whether to use celebrities or not in ads. We will keep that for another Sunday. But on the proposed changes in the law which could stop the party on its tracks for the so called Brand Ambassadors. Going back in time, I think ads whether print or TV just had people featuring in them and were called as models. And then slowly the practice of plugging in celebrities like actors, sportspersons,… crept in as I mentioned, probably to make the communication stand out. 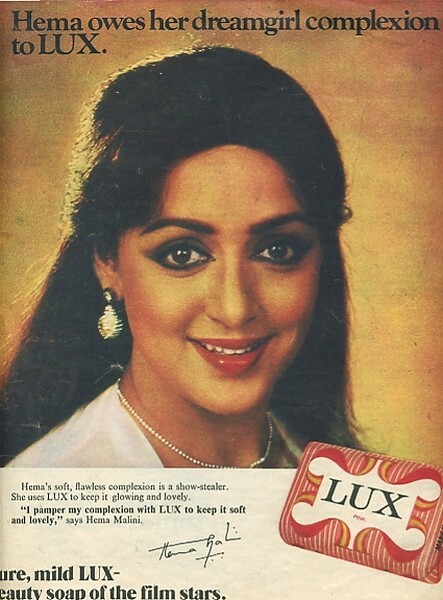 I am not sure when this “celebrities modelling” for an ad morphed into “endorsing the product” and then as we see now becoming “brand Ambassadors” for the company. As long as celebrities “featured” in ads for products I guess they were just plain actors parroting some lines. But when they started endorsing brands (making a killing in the process) – that’s when I guess they came into the ambit of influencing buyers’ decision and of course within the prying eyes of lawmakers. In my understanding there are 2 types of celebrity endorsements. First, where a celebrity is used to promote a product which is related to what he/she is doing and is a direct endorsement. For example – A Sachin or a Kapil Dev being used to promote ‘Boost’- an energy drink for children. When Kapil says – “Boost is the secret of MY energy” there is a clear communication to moms that “if you want your child to become like me, do consider giving Boost to your kid”. Or when Katrina Kaif says – “if you want a smooth skin like mine, use Lux Soap”! The second category is where brands just use a celebrity as a face in the ads and the products may not be related at all. For example – Amitabh Bachchan featuring in Binani Cement ads. And probably there exists a third category – where the product is not related to the celebrity’s field of normal work but companies tap into the credibility of the star to push their wares. Though this is not common, we have started seeing this of late. For example, when Cadbury’s wanted to make a comeback after they got hit by the “worms inside chocolate” tornado, they dialed in Amitabh. Amitabh featured in the commercial as “himself”. See the ad here. As you can see in this TVC, he was clearly putting his personal credibility at stake to communicate to consumers that with the many steps taken by the company, “All is well” with the chocolates! In the whole business of celebrity endorsements, many questions do arise. Do the celebrities who extol the virtues of brands use the product/service themselves? Have they first checked if the claims they are making are true? In the case of endorsing for investment projects,.. do the celebrities vouch for the credibility of the promoters? The thinking behind the proposed changes in the law seems to be after many instances of consumers landing in the pit after they invested their hard earned money in projects which also had big stars endorsing the same. At the same time, there have been so many cases where consumers lost money in projects where stars were not at all involved! It is difficult to believe that consumers are so gullible that they buy a product just because a star endorses it. This premise seriously underestimates the intelligence of a consumer. If just a star endorsement can make a product tick, all those mobile phones with celebrity brand ambassadors must be outselling the I-phone isn’t it??? But whatever it may be, punishing celebrities for wrong claims of a product because they feature in the ads seems a bit farfetched. A consumer is expected to do his/her bit before deciding to buy a product/service. More so in the case of big investments. Putting the blame on a M.S.Dhoni just because a real estate project he endorsed didn’t see the light of the day is sheer escapism, I believe. I think we should consider celebrities featuring in ads as enhancing the entertainment quotient and nothing beyond that. At the same time as a socially conscious individual a celebrity should be careful in lending his/her name or face to a product which has inherent health concerns a la Gopichand who refused to feature in Cola ads in his prime time! And also do a bit more homework on the credibility of the brand/promoter before signing on the dotted line for the next 1 crore endorsement deal. Or else post the new law it will be “Ad today, Sad tomorrow”!!! It may still be a long way to go to reach the iconic status of that ad line – “You have come a long way, baby!! !” of Virginia Slims cigarette but this line – “What an Idea, Sirji? 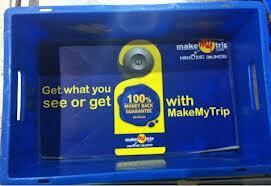 ?” is for sure within India atleast getting there as one of the most memorable ad lines of our times. And for the campaign itself the silver lining was the use of SMS poll among people by the Aam Admi Party (Now don’t ask me what’s this 🙂 🙂 ) to check if they should form the Government in Delhi or not. And not surprisingly Idea cellular re-ran their old TVC with a changed voice over – “Dilli mein Sarkar banana chahiye?? ?” Smart stuff. In part 3 of this series –“Ideas Mela” – What an Idea, Sirji?? ,(you can read Part 1 and Part 2 here and here) I talk about few more campaigns which have used media differently and smartly to take their messages across to their target audience. 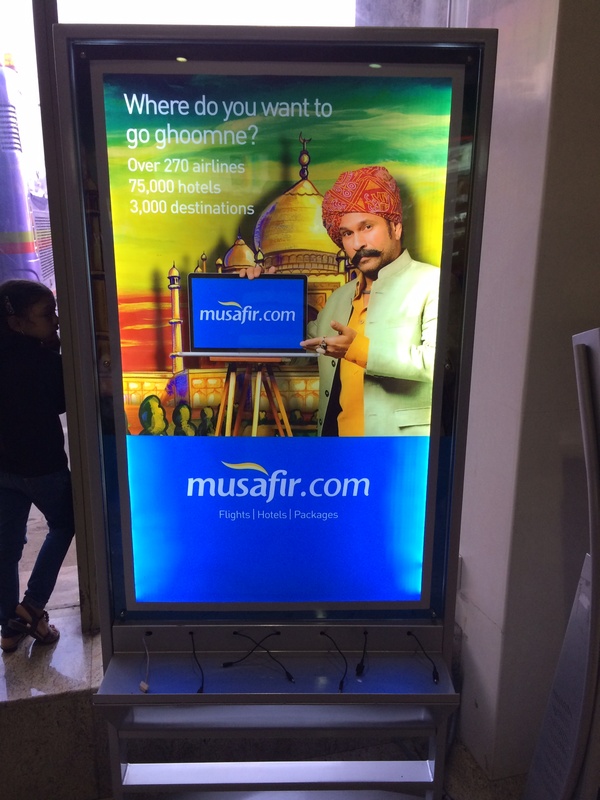 At the airports these days (Mumbai for sure) it is difficult to miss the branding presence of a new travel portal called Musafir.com with Sachin Tendulkar as its brand ambassador. Instead of plain vanilla panels and standees,.. Musafir has deployed quite a few Mobile charging terminals with their branding ofcourse in vantage points at the airport – a great way to connect with aspirational travelling public. 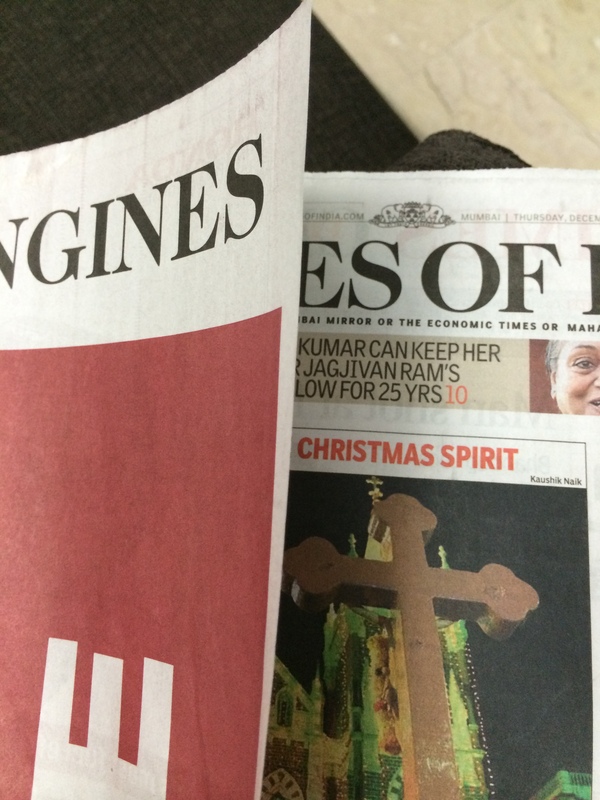 On the 26th Dec, 2013, the Times of India newspaper became “Engines of India” thanks to the Half Flap innovation. The ad for Honda City engines I think hit the bull’s eye with just that one release. Talking of Times of India and innovation, the other good idea which comes to my mind is of Oral B Toothpaste. 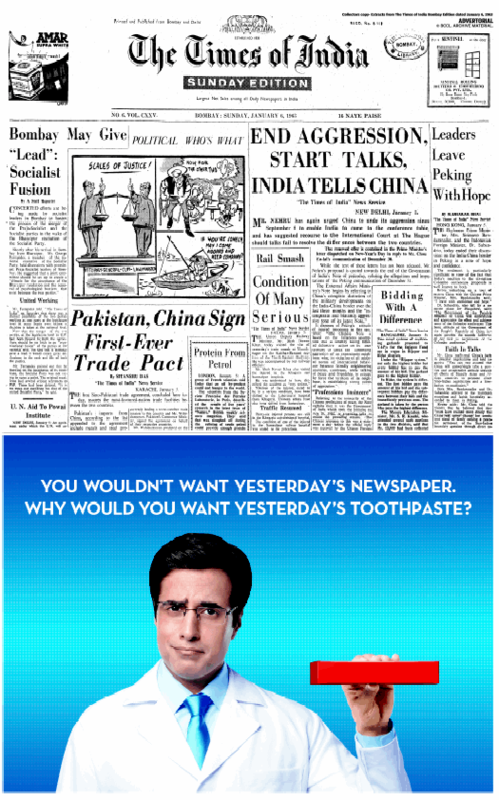 On the 6th of Jan, 2014, they reproduced the 1st page of yesteryear TOI paper of 6th Jan 1963 with a half page ad for Oral B toothpaste which said – “You wouldn’t want yesterday’s newspaper. Why would you want yesterday’s toothpaste?? ?” taking a dig at their longstanding archrival Colgate! Oflate, I have noticed that PVR Cinemas have become showcase for interesting creativity. In my last post I remember sharing an instance. They have interesting ways of plugging promos of upcoming movies in the movie hall. For example, as part of their package of commercials before the movie, they show clips on maintaining theatre etiquette,… (no cell phones, no smoking,..) I remember when I went to watch a movie in January the film Gunday was about to be released. The pre-show clips were featuring the Gunday stars – Ranveer Singh and Arjun Kapoor. This doubles up as social messaging as well as promos for the new movies. But in terms of social messaging, this one by the Mumbai Municipal authorities I think tops the chart. 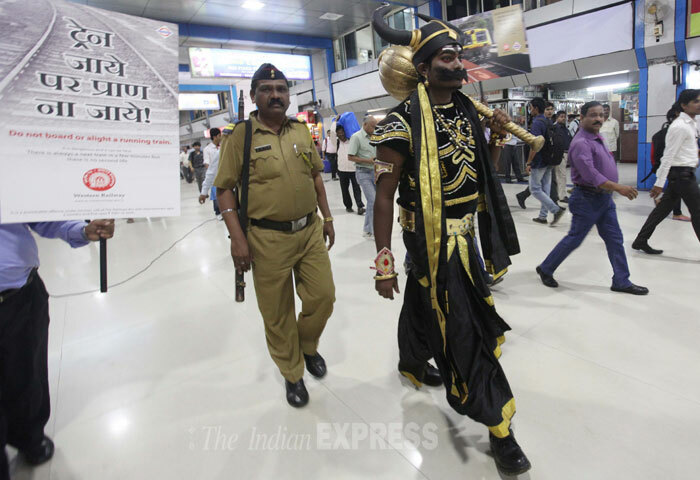 In order to deter people from boarding and alighting from running trains, the authorities used artists dressed up as “Yamaraja” to communicate the perils of such stupid acts to commuters in Railway stations. I am not sure, how many days they did this. But the sheer PR mileage you extract of such ideas is enough to keep this on top of the mind for few days. Advertising in Cabs or Cabvertising is fusty stuff these days. We see this very commonly for many brands. But what Ambi Pur, a car freshener product did was interesting and is worth mentioning. Apart from using the car freshener in the cabs, which creates an interest among people, they also went one step ahead of selling the product if customer is interested at the end of the ride in the cab itself. Brands these days are using the sort of time available during a car ride to sample their products as well as even sell like Ambi Pur did. The recent Loksabha elections indicated that political advertising has come of age in India. With the use of different media and platforms, brands – parties in this case in particular the BJP took political advertising to a completely different level. Sample this. On the day the BJP manifesto was released, I tweeted a message with #BJPManifesto and lo I get a direct message from Narendra Modi’s handle with a link to the party manifesto!!! 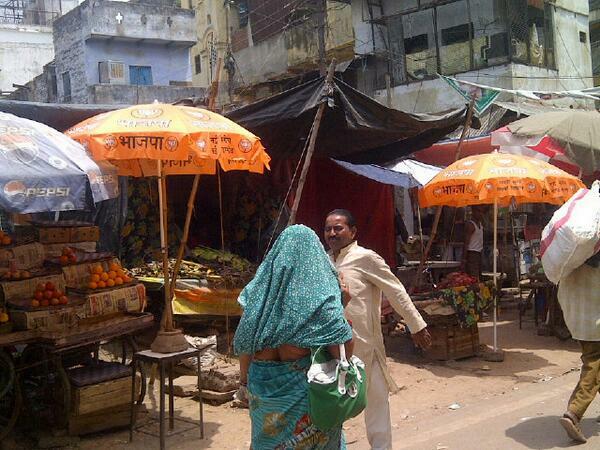 Also among various other media which the party used, I read about the party distributing large “branded” umbrellas to road side vendors,.. to beat the summer heat at Varanasi where Narendra Modi was contesting. That the umbrella is a metaphor for protection was not lost on people I would surmise. P.S : Talking of Ideas and their impact – One Spelling mistake in the title of the book made it an instant hit helping to sell millions of copies in just few days and the mistaken title was “An idea can change your wife” 🙂 🙂 – What a mistake, Sirji??? In the last few years, in airports across the world you cannot just miss one thing. 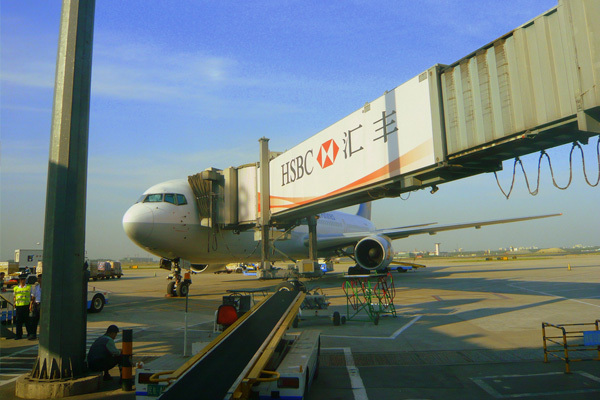 The ambience at the airports may be different, the service levels may vary, but one thing which was common was the HSBC branding at the “Aerobridges” whether it was Los Angeles, London, Delhi, Singapore, Honk Kong or Tokyo. I’m not sure of the year when it started but if my memory serves me right, it could be 2010/11 when HSBC kicked off its global campaign positioning itself as “The World’s Glocal Bank” and the one of the main medium they chose to carry this message across was the “Aerobridge” at most of the international airports across the globe. In line with the campaign theme of being a “Glocal” bank, while the medium and treatment were unified on a pan world basis, the creative itself was localized and changed from one country to another. 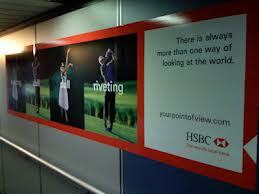 So much so HSBC earned the moniker – “Airport brand”!!! Though there is nothing novel about branding in airports and this would seem as just another OOH ( Out Of Home) medium this “Glocal” execution of the campaign simultaneously as I understand in some 25 odd countries in may be around 100 airports certainly falls under the “What an Idea Sirji” category. 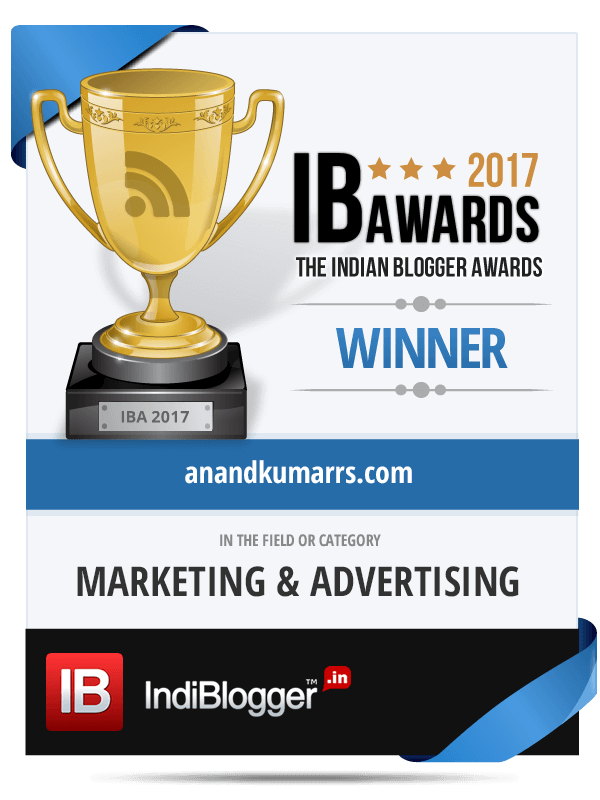 In my earlier blog post – “Ideas Mela – What an Idea Sirji” ( read here), I had touched upon a few campaigns which used media innovatively to carry their message across. In this post, I am talking of a few more such ideas which I came across and felt worth sharing. These are not creative ideas perse’ but ideas where the media chosen were different and hence groundbreaking. Continuing with Airports, in the post 9/11 era we live, going through the long security drill seems unavoidable. 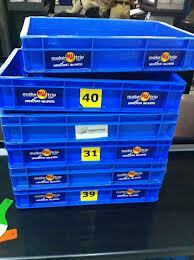 As part of this drill is the need to remove our laptops/Tablets,.. and put them in trays for screening. These trays have become a novel branding medium. I don’t know which brand hit upon this first. But now I see that many travel websites like makemytrip, expedia, goibibo,.. have likened to this idea and may be sponsoring these trays and branding them. Airports, travel and travel websites are all related and it seems to be a great idea for these brands though I see a trend of all travel companies jumping into the tray b(r)andwagon and hence may not be so distinctive anymore. There was a time in India when immigration counters at airports use to be chaotic to say the least. Particularly when you are returning home after a long trip you rue the thought of spending an hour again in the maddening immigration line upon arrival. Some people believe it is unruly even now. But I for sure feel that there is a marked improvement on this front in the last 5-6 years. Wait a minute, why I am talking of this here??? Well part of the solution to the problem apart of training of the immigration staff,…,… has been the introduction of a single line at the end of which people are directed to many counters. As you stand in the line and wonder invariably of the Incredibility of India, you cannot just miss the branding on the rods which are used to form the line. (Sorry no picture due to security reasons!!) Thomas Cook was a pioneer in this and used this medium quite well which I feel is inventive. Again, immigration lines, airport, travel, Convenience, Thomas Cook all conjure up an association in the minds and I thought it was a great idea for a Travel company. Airports are not the only place where you stumble upon great ideas. You could in Multiplexes too and that too in obscure places like “loos” like I did. “Dixcy Scott” a men’s innerwear brand found some strategic spots inside the Men’s washrooms for promoting their wares. I was surprised first, amused later and was impressed finally to find posters with captions like “Aim and Shoot”, “Size doesn’t matter” and “Do not give into pressure” placed just above the wall mounted men’s urinals. These apparently staid copy lines bring another dimension when placed at the right place. So much for “placement”. Surprisingly I saw this campaign only for some time and I don’t see it these days. When you talk of Ideas and Innovation it is seldom that Fevicol and its ilk get left out. This time it showed up even in the “Online” space. In April/May when the spot fixing/ match fixing drama in IPL was dominating the headlines in India, this idea from Dr.Fixit – a Fix all adhesive product from Pidilite was kickass. 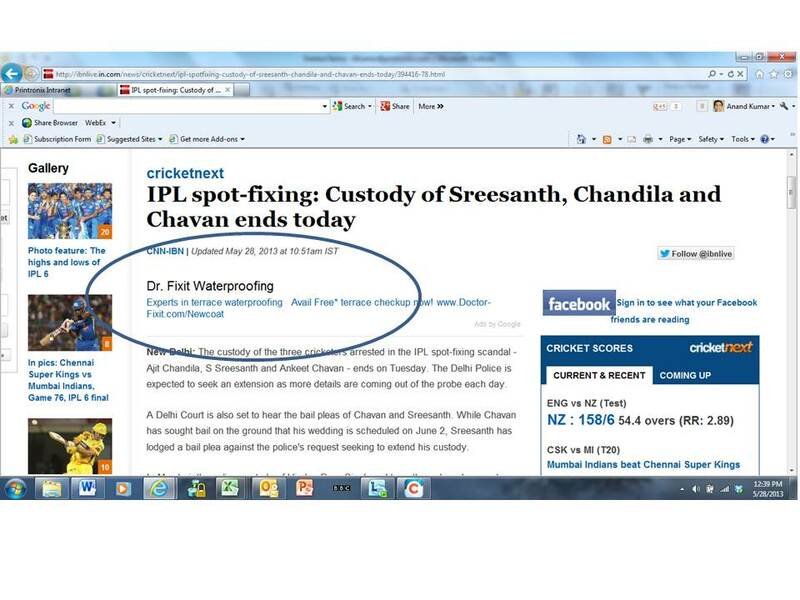 In that period whenever I was googling for any news on match fixing, IPL,.. invariably I tripped on banners for Dr.Fixit routinely on the side. I noticed this casually once and then when I repeated the search, I found the banner appearing in other IPL related sites as well which left me quite impressed on the smart SEO/SEM work. See for yourself the visuals. In recent times, one can say that the film Chennai Express was a case of a clear box office hit made possible by some great marketing. A film with not so great/unique story line and many other fault lines which could have ensured it to be a box office dud (looking at past films of this ilk) turned out to be one of all time big grossers. And certainly the big bang/big buck marketing blitz and PR played a great role in this. One piece in this marketing spend which caught my attention was the use of “Train” like cut outs (see pic) with branding of the film inside multiplexes couple of weeks before the film release. The windows in trains which you usually see were replaced with LED displays (like TV) and were continuously feeding promos of the movie including song clips, trailers, Making of the movie,.. As people were waiting outside the movie hall this was a good opportunity to grab eyeballs and generate a positive buzz about the movie and it certainly did. The film took to a great opening and as the cliché goes rest is history. 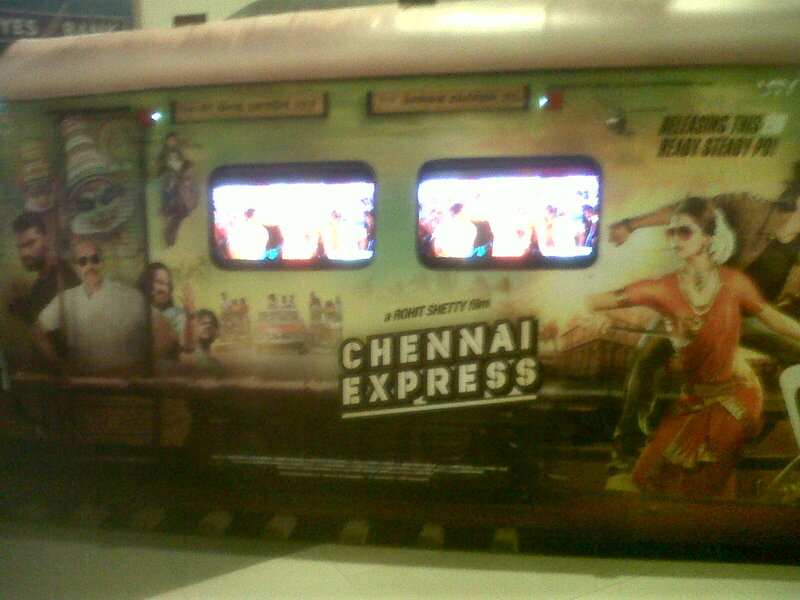 History will record Chennai Express as one of the top movies of SRK. Staying with filmy stuff, watching Mahabharat on TV every week was part of my growing up memories. Sunday morning was the time to roll on the highways and take some sunbath as you will find no traffic when Mahabharat was on air. Some people attempted to re-create Mahabharat on TV this time on 3D. So the 16th Sep edition of the Times of India carried a full-page ad for the serial Mahabharat. Along with the paper a 3D glass was also given away. Again a different dimensional thought to get some TRP going and for sure a great idea. Now I’m not sure if the TRPs soared or for that matter if the said channel is continuing with Mahabharat as of now. Similarly I am not privy to the sales revenues after the above so called great ideas were unleashed. Hence the often heard of “What an idea Sirji, but no impact on sales Sirji” remarks in the corridors of corporate houses and facebook walls will continue and keep us busy. 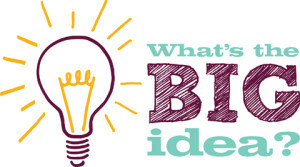 Nevertheless Great Ideas need recognition and celebration. If you have come across some interesting use of medium, please do share here. Postscript: There is one more media innovation which I missed to cover here. 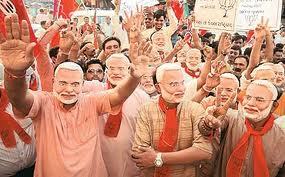 That is of the use of “Modi Masks” during the last Gujarat State Elections. Among other things it certainly contributed in building the “Modi Persona”. It will now be interesting to see if the “ModI Kites” which have been unleashed recently, help in soaring of the BJP/NaMo fortunes in 2014.